What are stinkhorns? Stinkhorns are mushrooms that are found from the tropics to more temperate regions such as Wisconsin. They can suddenly appear in mulch, lawns, and areas with bare soil. These visually-shocking fungi get their common name from their characteristic, unpleasant odor. 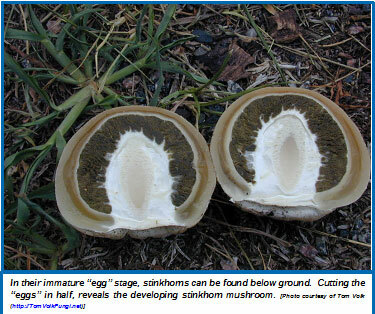 Although they are often unwanted additions to home gardens, stinkhorns do not cause plant dise ase. Because stinkhorns can grow on dead organic material, they actually are beneficial in that they contribute to the recycling of plant debris into nutrients that improve soil fertility and can be used by garden plants. What do stinkhorns look like? Stinkhorns grow into various shapes, but they are best known for looking like horns or penises. A few species grow several appendages, resulting in an octopus-like appearance. Some species have a veil attached below the cap that resembles a lacey skirt flowing from the mushroom’s hollow stalk. Stinkhorns can range in color from white, beige, and olive to bright orange or red with black accents. The tips of mature stinkhorns are usually coated in a spore-containing slime. Gardeners often discover immature stinkhorns as they dig in the soil. The immature forms appear as whitish to pink or purple, egg-shaped masses. Stinkhorns develop rapidly sometimes growing up to four to six inches per hour, and can generate enough force to break through asphalt. Where do stinkhorns come from? Stinkhorns are often first introduced into a garden in organic materials (e.g., soils and mulches) that contain microscopic hyphae (i.e., fungal threads) of stinkhorn fungi. Once stinkhorns mature, they produce a pungent, off-putting odor that is reminiscent of rotting flesh or dung. This smell may disgust people, but it attracts insects, particularly flies. Flies and other insects eat the slimy material at the tips of stinkhorns and carry spores in this slime to new locations as they move around in the environment. In many ways, this process is comparable to the distribution of pollen by bees (but of course without the more appealing scents associated with most flowers). How do I control stinkhorns? Stinkhorns are short-lived and will naturally disappear quite rapidly. If stinkhorns are too unsightly, if their smell becomes too putrid, if they attract too many insects, or if there is concern about small children or pets eating them, pluck them from the ground and discard them as they appear. Keep in mind however, that removing stinkhorns will not eradicate them. Stinkhorn hyphae will remain in the soil or mulch and will eventually produce other stinkhorn mushrooms. In addition, flies and other insects carrying stinkhorn spores can introduce these fungi to new locations. How can I prevent problems with stinkhorns in the future? No fungicide treatments or other methods are available to prevent stinkhorns from appearing in a garden. Removing organic matter (e.g., mulch) or reducing soil moisture may reduce the number of stinkhorns that appear. 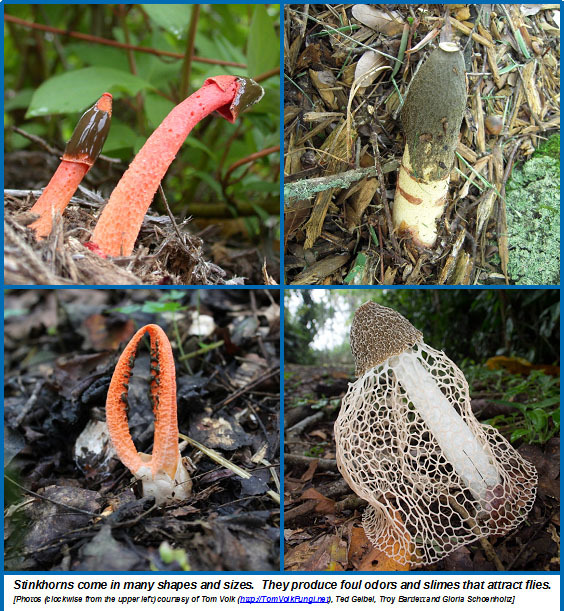 However, these strategies are unlikely to eradicate stinkhorn fungi. Therefore whenever stinkhorns appear, consider embracing their unique beauty and enjoy their brief time in your garden.